This is the final edition for the cookbook swap – Welsh Rarebit (sometimes referred to as Rabbit even though the sole protein is cheddar cheese). 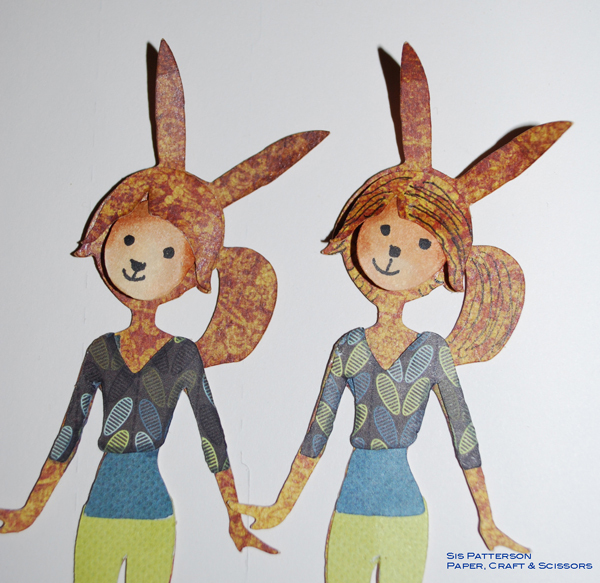 I used Paper Doll Teen Scene as the rabbit base and added ears through the Cricut Craft Room aka CCR (take a circle and lengthen it and narrow into bunny ear shapes and weld before cutting). All of the stylish rabbit clothes are also from Paper Doll Teen Scene. I used CCR ovals for the rabbit faces and drew in the facial features. I used my Copic multi-liner for both the facial features and to add definition to the female rabbit’s hair. You can see the difference that such a simple step makes here. The rabbit on the left definitely has helmet hair. The kitchen cabinet, cheese wheel, and recipe title are Silhouette Cameo cuts. And his utensil is a charm attached via a brad under his paw. 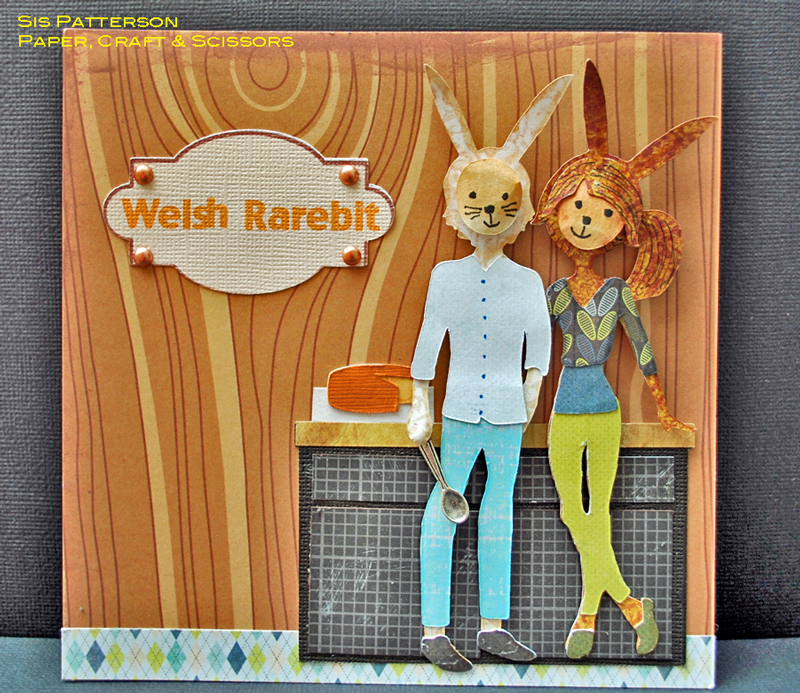 It was a lot of fun to make a pair of stylish Welsh rabbits – actually it was a dozen pairs of stylish Welsh rabbits, and it was a pleasure to participate in this swap over the past year. I have made some marvelous friends, gained some fabulous recipes, and had a lot of fun with each page I created. Oh, WOW!!!!! This looks so fun & it turned out awesome!! You’re right, the copic details made a world of difference in her hair…apparently, helmet hair’s not a good look for anybody LOL!!! Very stylish bunnies!! This swap sounds like SO much fun!! This is fabulous — love your figures!! Hmm, would these be considered altered rabbits? Oh, my goodness! This is a wonderful recipe page! You are so creative!! Your rabbits are so stylish!! This is so much fun and so clever. I love that they are “masked” to look like rabbits and how cool that you did that on CCR. Love the way you added the pen details– really adds so much and gives your page a real custom made look. Love your altered figures (as always!) and the fun play on words. Perfect use of patterns and I adore that little spoon! How did I miss commenting on this adorable page?! I have been lucky enough to see this in person, and I have to tell you, as cute as it is here, it’s an even bigger treat in real life. This slim, stylish couple in their European apartment couldn’t be more any more fun. Love the idea, the play on the title, the cleverness of dressing Will and Kate as “rarebits.” I couldn’t be any more in love with paper if it grew a hand and a glass slipper on my foot. Adore it, Sis! You rocked this entire cookbook!